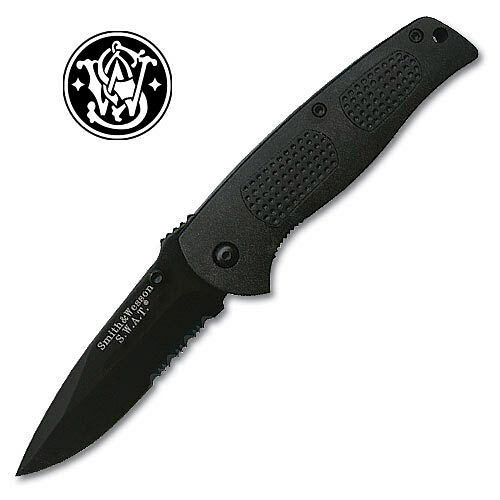 Smith & Wesson Teflon Serrated Swat Folding Knife | BUDK.com - Knives & Swords At The Lowest Prices! For centuries Smith & Wesson has continued to amaze the self-defense industry with their top quality weaponry. This new addition is no different. The 3 3/4" blade is teflon coated and razor sharp. Gripping the handle you will quickly realize how easy the blade emerges from the air craft aluminum handle with the operation of one hand. 8 1/2" overall.